Big Sky offers a variety of lodging options from hotels to condos, luxury to economy, with most properties having ski in ski out ski access or just a short walk. Beaverhead is the most popular ski in ski out property amongst groups as the condos have spacious floor plans and decorator touches. Unit size ranges from two to four bedrooms. Most units have private garages, laundry facilities, some even have private hot tubs! This is the most popular group property at Big Sky as it offers affordable lodging options for guests with all of the comforts of home. Big horn units range in size from one to three bedrooms with views of Lake Levinsky and Lone Mountain. 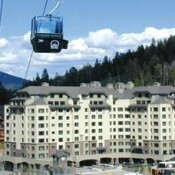 They are walking distance to the slopes with their own Poma Lift and a short 1/4 mile walk to the Mountain Village Center. 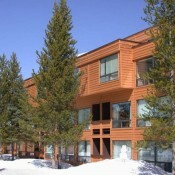 This recently remodeled three story lodging is a prime ski-in/ski-out property. They offer hotel rooms that sleep 4 people or a loft that fits 6. The Huntley Complex contains Chets Bar and Grill; Firehole Lounge; several fun shops; the Solace Spa. 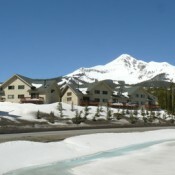 The Summit is the premier hotel in Big Sky situated at the base of the mountain and in the core of the Mountain Village. They offer hotel rooms, pent houses, and a few condominium style units. Your stay at The Summit includes hot breakfast during the winter season, daily maid service, and indoor pools and hot tubs. Along with most other amenities offered by high end hotels. Bozeman (BZN) is the closest airport to Big Sky and is located a short 38 miles away. The airport itself has a quaint mountain feel. The waiting area where you receive your bags feels like you are in a log cabin with a fire place, tables, and places for people to relax while your bags arrive. It is common to see Montana mountain men hanging out in this area waiting for their loved ones to arrive. Sports America maintains special 'bulk' airfare contracts, as well as the entire range of standard retail fares, to ensure the lowest pricing for your group. Located 38 miles south of Bozeman (BZN) Big Sky makes for a short transfer after arriving to the airport. The drive from Bozeman to Big Sky is beautiful as the road winds next to a river with classic open space and Montana views. Groups often taken charter buses as their form of transportation. There are smaller shuttle and shared ride options available as well for smaller parties. Big Sky boasts a multitude of activities for the non skier. From zip lining, high ropes course, bungee trampoline, tube park, snow shoe tours, snow cat rides, wild life viewing, to snowmobiling, and more! One of the most popular activities is making a day trip to visit Yellowstone National Park with the park entrance only 48 miles away.